5000K CFL, Nikon D40, white seamless background paper, Douglas fir branch, a bunch of bailing wire, and a little bit of art. 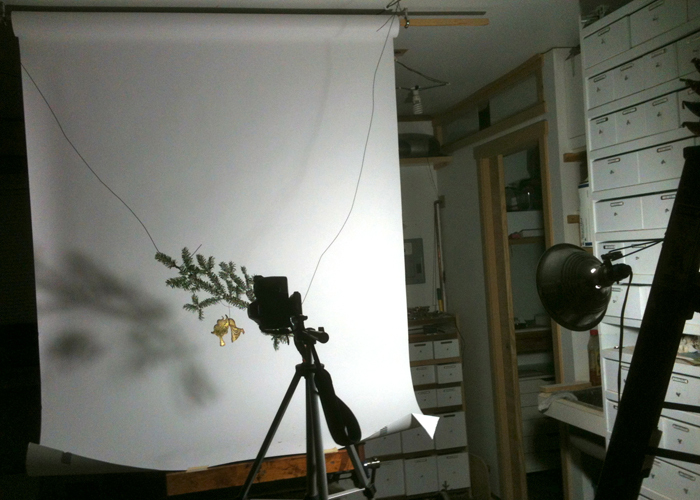 With the advice of J R Compton’s, “How to Photograph Art” I’ve started the process of re-shooting my work. The new images are better than the old ones but brass is still either too shiny or not shiny enough. Oh, how I envy painters sometimes. This entry was posted in making and tagged photography. Bookmark the permalink. I used to get a terrible glare on my oil paintings before I started scanning everything. I would take them into a shaded area without direct sunlight on a bright day that had a lot of diffused light and they photographed wonderfully. Maybe a similar approach would work for metal? Thanks, I’ll give it a try next time around.